The State Theater. Courtesy of CinemaTreasures.org. 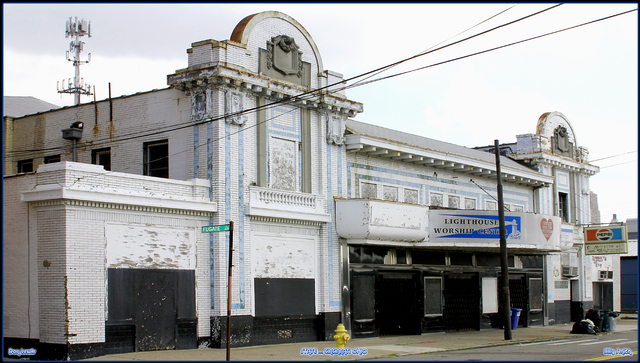 The State Theater at 1504 Central Avenue is slated for demolition to make way for the new FC Cincinnati Stadium in the West End. What follows is a brief history of this building. Built in 1915, it was first known as the Metropolitan Theater. A vaudeville theater at this time, the Metropolitan had a series of managers and lasted until the late 1930s. From the 1940s to the 1980s, the theater—then called the State Theater—was both a movie theater and a live music venue. Much of its entertainment was geared toward the African American community of the West End. In the 1990s, Lighthouse Youth Ministries bought the building and maintains it to this day. 1891 view of the block of 1504 Central. Prior to the theater, it was a series of buildings, many of which had first-floor storefronts. Courtesy of The Ohio State University Libraries. It was built on top of several older buildings, most of them 3-stories with commercial first floors. Updated view of the block of 1504 Central. 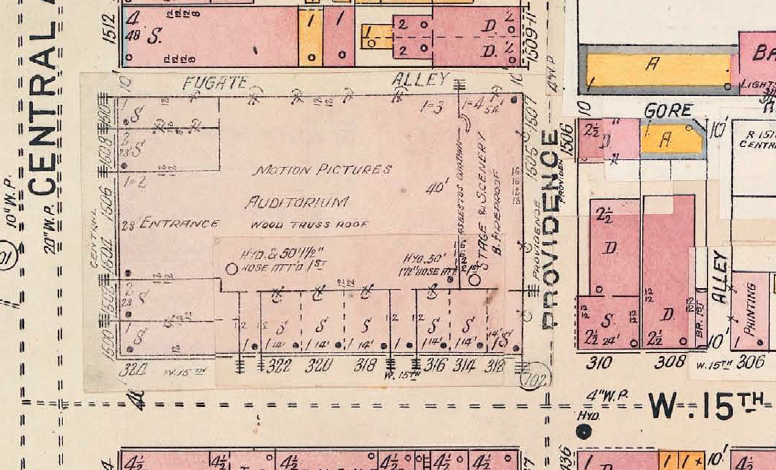 This Sanborn Insurance Map, accurate to the 1930s, shows the theater on Central Avenue. Courtesy of the Public Library of Cincinnati and Hamilton County. The Hamilton County Auditor lists Nicholas Longworth II (1869-1931)—as in, the Nicholas Longworth from the prominent Cincinnati Longworths; he was a lawyer who served as a congressman and later Speaker of the House—as the owner of the theater (or the plot of land on which the theater sat). After his death in 1931, his wife Alice Roosevelt Longworth (1884-1980)—as in, the Alice Roosevelt Longworth, daughter of President Teddy Roosevelt—owned it. 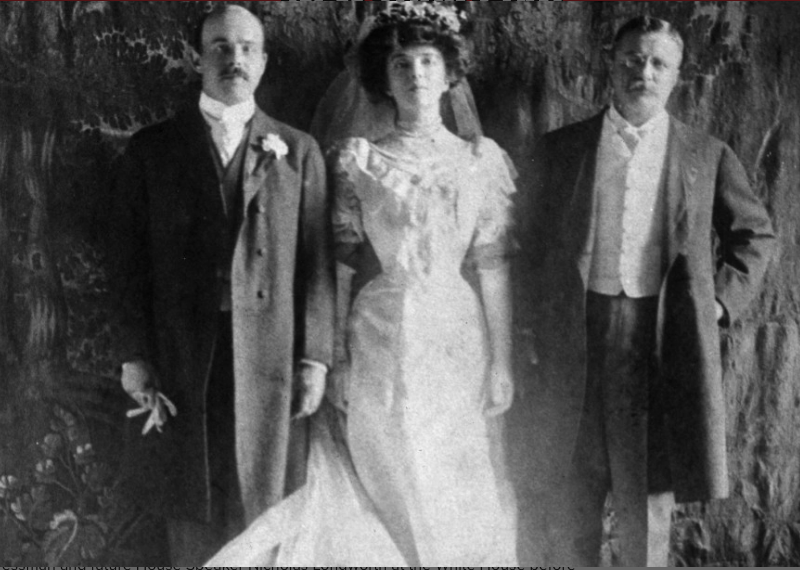 Nicholas Longworth II, Alice Roosevelt Longworth and her father President Teddy Roosevelt, 1905. Courtesy of New York Post. In these early years, the theater was a vaudeville and showed silent films. Later by the ‘30s, it also had wrestling (even women wrestlers!) and live music. Many of the Metropolitan’s managers from the 1910s to the 1930s were first- or second-generation immigrants—and many of them Jewish—who came to the U.S. in the late 1800s and settled in the West End (this trend would hold with the building’s transition to the State Theater). Their involvement in the theater speaks to the demographic makeup of the West End then—a very densely crowded working-class immigrant and increasingly African American neighborhood. Some of its early managers were members of the Linch family, including Nathan Linch (1856-1938), his son Harry (1885-1971) and another Linch, Edward (presumably related). The many theaters of Cincinnati in 1920. The West End had several at this time. Courtesy of the Public Library of Cincinnati and Hamilton County. Happy customers writing in. Cincinnati Post, November 28, 1931. Courtesy of the Public Library of Cincinnati and Hamilton County. The Metropolitan Theater also featured wrestling. Cincinnati Post, October 25, 1932. Courtesy of the Public Library of Cincinnati and Hamilton County. The Metropolitan Theater looking for local talent. 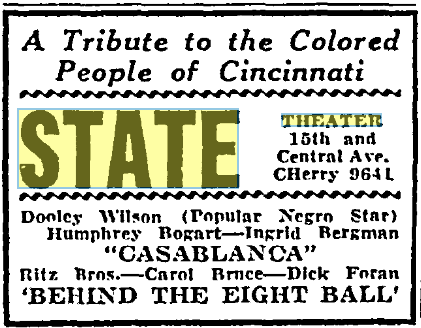 Cincinnati Post, January 21, 1932. Courtesy of the Public Library of Cincinnati and Hamilton County. The Metropolitan Theater featured radio personality Dulcy Marcum and her dulcimer. By the 1930s, it had a lot of “hillbilly” (what we would call bluegrass or country) musicians playing there. Cincinnati Post, December 2, 1931. Courtesy of the Public Library of Cincinnati and Hamilton County. Cincinnati Post, March 26, 1949. Courtesy of the Public Library of Cincinnati and Hamilton County. 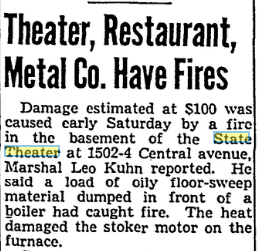 Reflective of its neighborhood, the State Theater was a place purposefully for African Americans. It sought out Black employees and made a point of having events specifically for the Black community—supplying entertainment for World War II Black soldiers, for instance. Cincinnati Post, September 1, 1943. Courtesy of the Public Library of Cincinnati and Hamilton County. Cincinnati Post, October 8, 1943. Courtesy of the Public Library of Cincinnati and Hamilton County. Cincinnati Post, July 6, 1946. Courtesy of the Public Library of Cincinnati and Hamilton County. Cincinnati Post, July 8, 1946. Courtesy of the Public Library of Cincinnati and Hamilton County. Especially by the 1960s into the late 20th century, it was known for playing Black-made and Black-centric movies as well as martial arts flicks. 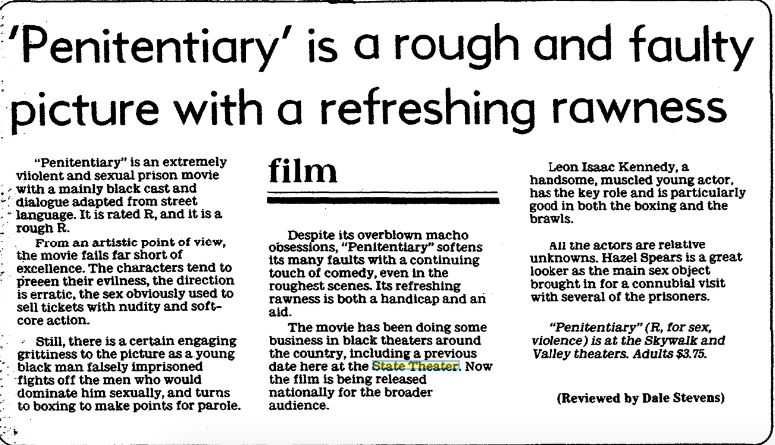 It screened films such as Uptight (1968), a movie about Black life in the late ‘60s in inner city Hough, Cleveland (check out some footage from the movie here) and later Penitentiary (1979), a film about an African American man falsely imprisoned. (The Regal also showed similar movies by the late 20th century). Cincinnati Enquirer, March 10, 1969. Courtesy of the Public Library of Cincinnati and Hamilton County. Cincinnati Post, March 28, 1980. Courtesy of the Public Library of Cincinnati and Hamilton County. The building suffered from two (fairly minor) fires in the 1940s. Cincinnati Post, July 6, 1942. Courtesy of the Public Library of Cincinnati and Hamilton County. Another fire. Cincinnati Post, August 19, 1944. Courtesy of the Public Library of Cincinnati and Hamilton County. 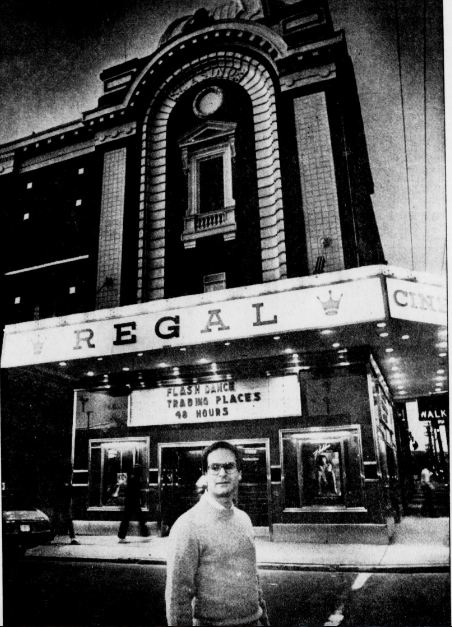 Gary Goldman in front of the Regal in 1983. Cincinnati Enquirer, November 26, 1983. Courtesy of the Public Library of Cincinnati and Hamilton County. In January 1984, Frank Allison purchased the State Theater. Almost two years later, after much renovation work (a new roof, new carpet, upholstering and securing the seats, new paint), Frank Allison Jr., who had previously worked as a sales rep for Burger Beer, converted the theater into Allison’s West End Theater. The aim was to host a variety of shows as well as feature historic Black films, local boxing and wrestling and children’s programs. Frank also intended to work with the Black Film Makers Association to develop a chorus line for the theater. Frank Allison inside the State. Cincinnati Post, August 23, 1985, Courtesy of the Public Library of Cincinnati and Hamilton County. [i] 1915 Williams’ City Directory, Public Library of Cincinnati and Hamilton County; Allen J. Singer, Stepping out in Cincinnati: Queen City Entertainment 1900-1960 (Charleston: Arcadia Publishing, 2005). [ii] 1910, 1920, 1930 and 1940 Federal Censuses, Ancestry.com; FindaGrave.com. [iii] Williams’ City Directories, Public Library of Cincinnati and Hamilton County. [iv] Williams’ City Directories, Public Library of Cincinnati and Hamilton County; FindaGrave.com. [v] U.S. Social Security Death Index, 1935-2014; 1910, 1920, 1930 and 1940 Federal Censuses; Ohio, County Marriages, 1774-1993, Ohio Soldiers in World War I, 1917-1918, Ancestry.com; “Clarence Brunemann,” Cincinnati Enquirer, October 4, 1967; 1930 Williams’ City Directory, Public Library of Cincinnati and Hamilton County. [vi] Williams’ City Directories; “William C. Miller,” Cincinnati Post, May 9, 1939, Public Library of Cincinnati and Hamilton County. [vii] 1939 and 1940 Williams’ City Directory, Public Library of Cincinnati and Hamilton County. [viii] Gayle Harden-Renfro, “Curtain up,” Cincinnati Post, August 23, 1985, Public Library of Cincinnati and Hamilton County. [viv] Zane Miller, Boss Cox’s Cincinnati: Urban Politics in the Progressive Era (Columbus: The Ohio State University Press, 1968); Zane Miller, Changing Plans for America’s Inner Cities: Cincinnati’s Over-the-Rhine and Twentieth-Century Urbanism (Columbus: The Ohio State University Press, 1998). [x] Quoted in John W. Harshaw, Cincinnati’s West End: Through Our Eyes (CreateSpace Independent Publishing Platform, 2009), 103, 99-115. [xi] 1910, 1920, 1930 and 1940 Federal Censuses; World War I Draft Registration Cards, 1917-1918, Ancestry.com. [xii] Hamilton County Auditor; John Johnston, “They saved the Esquire—and a neighborhood,” Cincinnati Enquirer, February 6, 2014. [xiii] Steven Rosen, “Theater Audiences Shrinking,” Cincinnati Enquirer, November 26, 1983; Gayle Harden-Renfro, “Hyde Park Theater faces end of show,” Cincinnati Post, September 30, 1983, Public Library of Cincinnati and Hamilton County. [xiv] Nick Miller and Nadine Louthan, “Local NAACP expects to tap new president,” Cincinnati Post, May 17, 1989, Public Library of Cincinnati and Hamilton County. [xv] Gayle Harden-Renfro, “Curtain up,” Cincinnati Post, August 23, 1985, Public Library of Cincinnati and Hamilton County. [xvi] Hamilton County Ownership Card and Conveyance Forms.